I adore Mike - there's no doubt about that. But I do not adore his love for stuff. He has a real problem with getting rid of things, and that includes clothes. 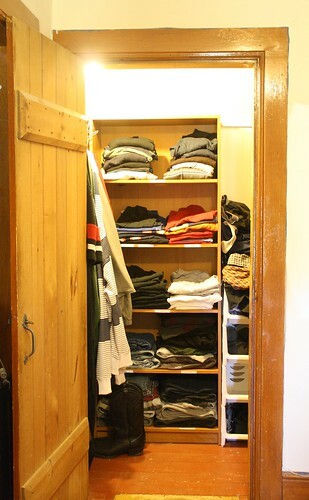 So while he was away this past weekend playing in a fastball tournament, I decided to tackle his closet. 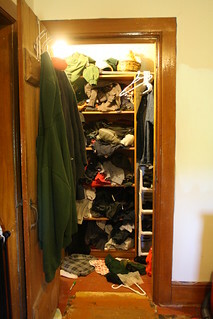 I do the laundry, and I was starting to go a little nuts trying to put his clothes away. 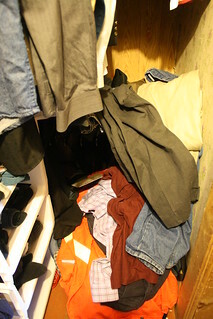 The guy could honestly probably go a month or so without having to turn on the washing machine (and this is why we can't share a closet - there's NO room for my stuff!). That being said, I didn't throw anything away - it's not my stuff to get rid of, especially when he's not here to voice his opinion. 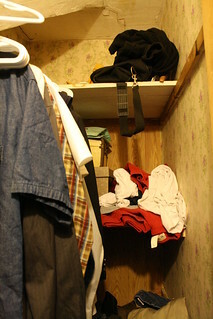 Instead, anything that was worn out, faded, or just generally ugly got rolled up and put into a separate basket and tucked away on a high shelf. But on to the pictures! 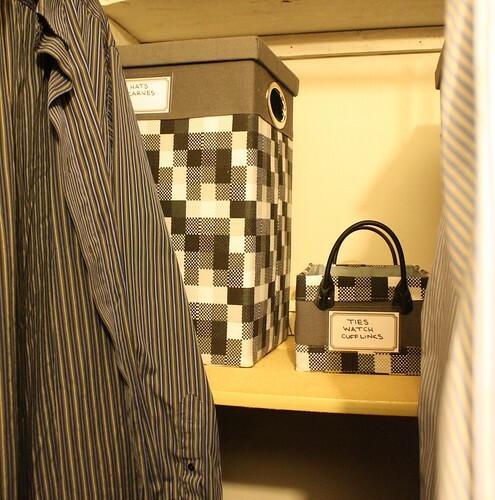 Apologies to those who might be expecting a grand makeover - you might as well click away now because let's be honest...it's just a guy's closet. That's where it started. 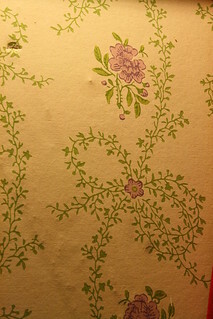 Stuff everywhere and really ugly vintage floral wallpaper. The first thing I did was take everything out. I then painted over the wallpaper with Para Paint's Empire Grey; the same colour I plan on using in the hallway (which means...I might actually get around to starting the hallway soon! But don't hold your breath or anything). Once the paint was dry, it was time to load everything back in, but this time in a thought out way. On the bookshelf are (is? I don't know, I hate grammar) sweaters, t-shirts, jeans, hoodies, pajama pants, and sweat pants. As much as it kills me, I labeled everything. I always used to scoff when I saw the most obvious and seemingly unnecessary things labeled. Well, I'm hoping this will help keep things from turning into a disaster zone again. 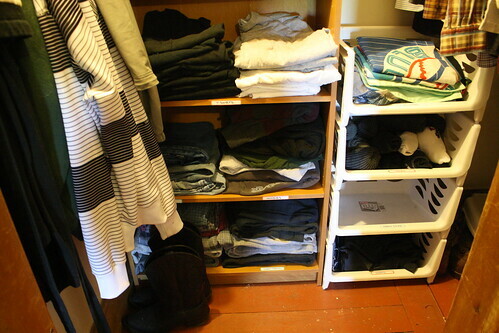 Ignore the pile of clothes to the right of the bookshelf - I took this picture when I wasn't quite finished. I ended up needing to buy a new closet bar. I wanted to switch the direction, and the current one was too big to work. 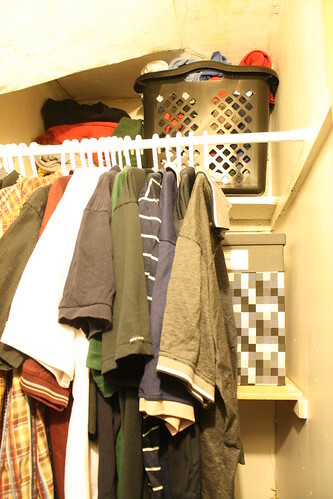 I also bought three bins from Home Outfitters - one for baseball hats, touques, and scarves, one for his baseball gear like pants, socks, and jerseys, and a small one for ties, his watch, and cufflinks. I thought the guy only had two ties. Turns out he has nine. His pants rack is actually usable now, and he can easily get to his work gear when he needs to. 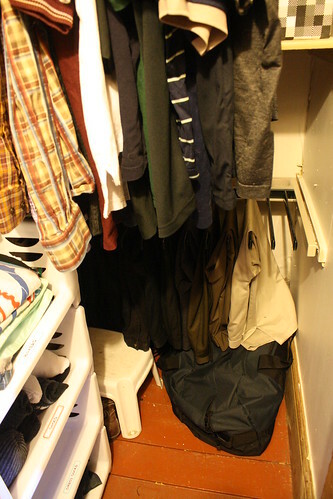 The stool is for me; I have some rogue laundry still needing to be put away and I'm sure I'll find more things to add to the "do not wear" bins on the high shelf. These cheap-o bins are labeled too. Boxers, socks, dress socks, shorts. All of the labels I used are by Martha Stewart/Avery. They really are the best!